Why didn’t Lehi and his family ever see or need the rod of iron or the path when they journeyed to the tree? And by contrast, why did so many of those who sought after and obtained the path & rod, then fall away? Reading closely, it is only those who relied on the rod to get through the mists of darkness that are specifically noted to have fallen away (of course, at least some of those who failed to use the rod were lost—a bit of a catch 22). And how could folks fall away simply because of the glitterazzi who were mocking them? They’d partaken of the blasted fruit already! Of course I don’t know. But here’s a few thoughts. Lehi & family’s conversion seems much more secure. They had to make use of the Spirit, or of their own pure striving, and they were motivated by family and by the tree & its fruit. I’m not sure what the motivations or social support systems of the others were—Lehi and Nephi don’t point that out—but the existence of a straight path and a rod of iron in the midst of a dark and dreary (empty space!) world seems to be a big part of their falling away. That resonates with me. We’re in the midst of a big, dark, fathomless, meaningless world. Lots of folks are desperate for and latch onto a path or a rod or some form of stability that’s provided; and for some, it’s clear that the path-rod itself is the comfort and the reward. In the midst of darkness, in the absence of inherent meaning, they are consoled by a straight, undeviating, perfectly reliable course (even if that course, in and of itself, simply leads through an empty field). I don’t know that I’m terribly opposed to that fact, or think poorly of it. An empty landscape (or nihilistic universe) is terrifying or at least bone-deep daunting. And clearly various forms of stability (e.g., a church) works for lots of folks—it can even bring them to the tree of life. Maybe it’s even necessary for some. And maybe that’s what our church is. But trying to rely wholly on such institutional structures and helps ultimately won’t work, any more than relying on a manual will work to give you a great lesson—both are insufficient. As our apostles keep reminding us, there is no church in the next life. I think my favorite (April 2015) General Conference talk was Elder Wilford Anderson’s. “I can teach you to dance, but you’ll have to hear the music yourself.” I think Anderson’s music relates to the fruit. I can’t imagine that anyone who tasted what Lehi tasted would fall away, certainly not simply because others mocked. They had the fruit—they even ate it!—but I don’t think they tasted it. Not as Lehi tasted it. Maybe it’s also the contrast: had they walked for hours in darkness first as he had? I don’t know. And maybe Lehi’s hours and hours in the darkness was simply a repeated circumambulation of the field—he had no path and rod, so maybe he simply never came to the tree until he was able to pray and receive revelation of the tree. God bless me with a full quota of darkness before giving me the fruit, so that I don’t miss what I have, so that I can learn to taste and distinguish via contrast the sweet from the bitter, so that my motivations and my becomings are celestial. So that I taste the love of God. Last thought: The great and spacious building for me today changed the way I read chapter 1, about Lehi’s ministry in Jerusalem (or maybe it’s the other way round—remembering Chapter 1 changed my reading of this vision). 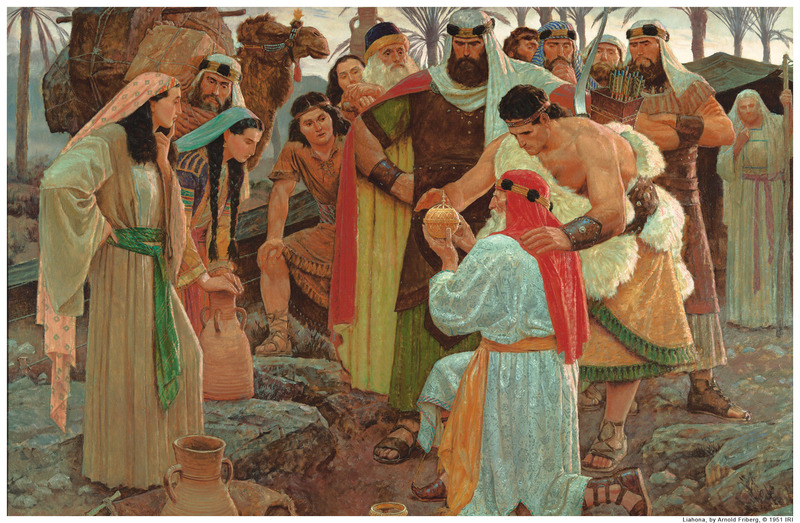 Given a vision, called as a prophet, I think Lehi had a choice—and maybe they were even both fine with the Lord. What would he do? I think he could’ve been popular, could’ve relayed a message that might even have been a good message, but done it in order to win the acclaim of the people. But he didn’t. He chose to eat the fruit, and chose his family over the comforts of the great and spacious building of Jerusalem. He chose to travel to a promised land and hailed his family to come with him. Lehi made it to the tree as a result of direct physical revelation from heaven. His family made it by listening to the patriarchal order of the priesthood (Father Lehi’s voice). In either case, the rod is a metaphor. They all made it by following the word out God, be it angelic, prophetic, patriarchal, or scriptural. I tend to think we have just a brief summary of Lehi’s vision. So items missing may not have been missing from the actual dream in question. It seems to me if, as Nephi points out, Lehi’s dream and his dream are common that Nephi waits for the later recital to get into more detail. Sorry for jumping around on your Reading Nephi posts. I’ve been busy, and am just having time to catch up on them now. There’s no expiration date for replying to articles, is there? I really, really like this post. I had noted the difference between Lehi’s path to the tree and the one with the rod of iron followed by later travelers, but had never made the connection that Lehi’s way seemed to be in many ways preferable to the later one. I think it has been so ingrained into me that the rod of iron is good and essential, that I was unable to look and see, as you were able to, that in some ways it is flawed. It’s also interesting to equate the Great and Spacious Building with Jerusalem. That seems like an obvious connection once you say it, but it is one I had never made. I’m really glad you’re doing this series. Thank you for your kind words mirrorrorrim. And no, there’s no expiration date!